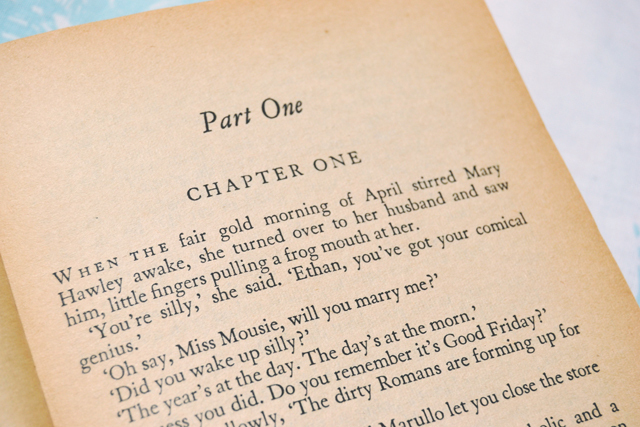 As I've mentioned many times before, Of Mice and Men is my favourite ever book. I'd always meant to read more Steinbeck and back in December, I finally got round to reading another of his works- The Grapes of Wrath. 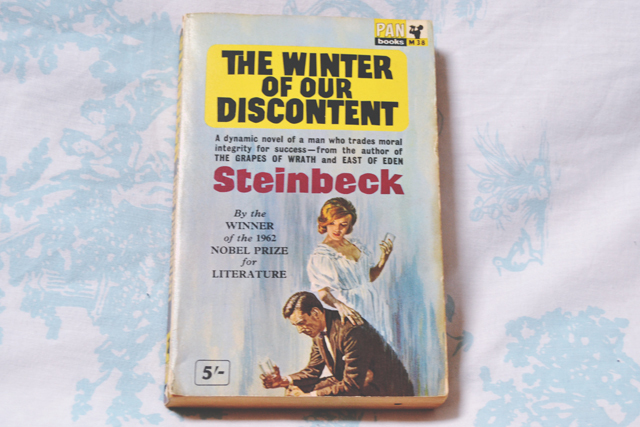 I enjoyed this a fair amount too, so when I found this stunning 1964 copy of his final novel, The Winter of our Discontent, in a charity shop, I just had to buy it! The novel tells the story of Ethan Allen Hawley, a married father of two from an influential, wealthy family who is a clerk in a grocery store after previous relatives squandered the family money.There isn't much of a plot: He works in the store that was once his family's, now owned by a Sicilian immigrant, and briefly considers bank robbery in order to gain some extra money to support his family. It's very, very different to the other Steinbeck novels I've read. Whereas those have page upon page of gorgeous descriptions, paired with insightful dialogue, this one just has a tedious narrative of Ethan's non-eventful days. 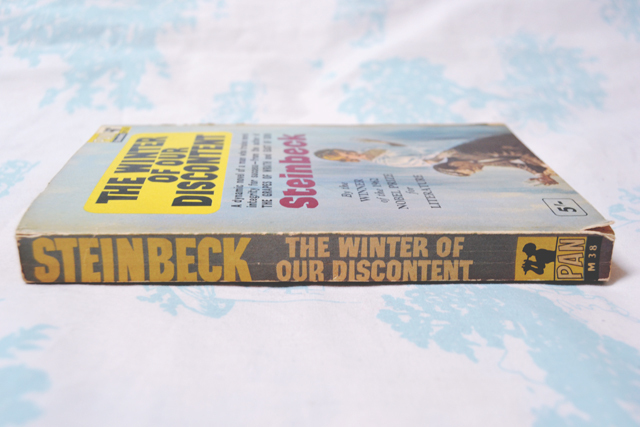 I was surprised by the dialogue, which I've found to be Steinbeck's strength, and not in a good way. It was just bland, and often with no indication of which character was speaking, leading to confusing muddles. I did, however, enjoy the way that Ethan constantly thinks up different sarcastically smitten nicknames for his wife, Mary ("My holy quail" was my favourite). Speaking of Mary, she was a totally pointless character. She had no substance to her, and just berated Ethan for joking all the time. I felt like shaking her and telling her to lighten up. Mind you, all of the characters were pretty two dimensional, with no depth whatsoever. Although this book was easy enough to read, I found very little redeeming about it. It lacks all of the great things about the other two Steinbeck novels I've read. In fact, it seemed as if it was written by a totally different author. Very odd! I did the same thing haha! This was towards the end of his life too so perhaps he just wasn't feeling it anymore! I LOVE Of Mice and Men. I could read it a thousand times over and not get bored! It is such an underrated book. I've never thought of reading another Steinbeck (in the same way that I can't bring myself to read A Cuckoo's Calling) simply because I worry that it would burst my love bubble for the author. Of Mice and Men is one of my all time favorites as well. I've often thought of venturing into other Steinbeck tales. Thanks for the warning on this one.